...And we're back from Part 1, the 60s and 70s shorts. 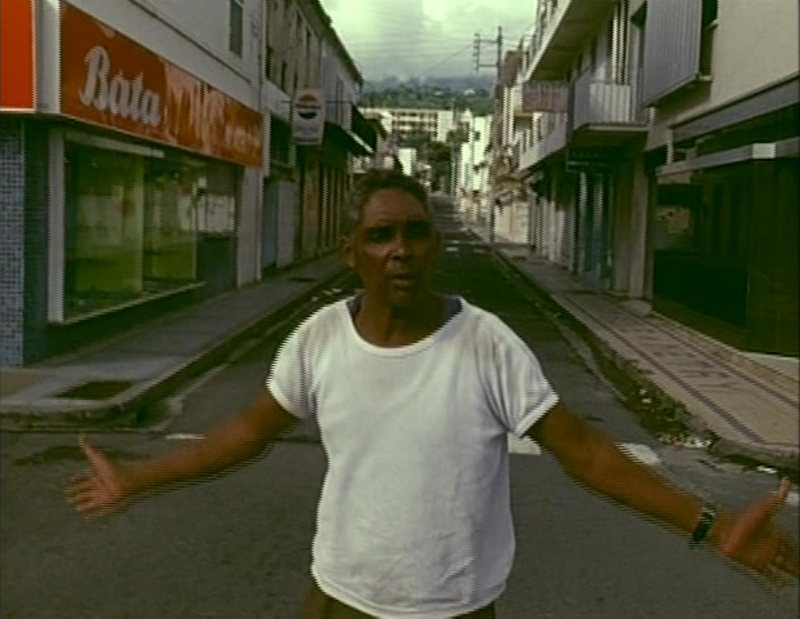 So let's start out with a Werner Herzog short that technically isn't a Werner Herzog short. Or at least he didn't direct it. 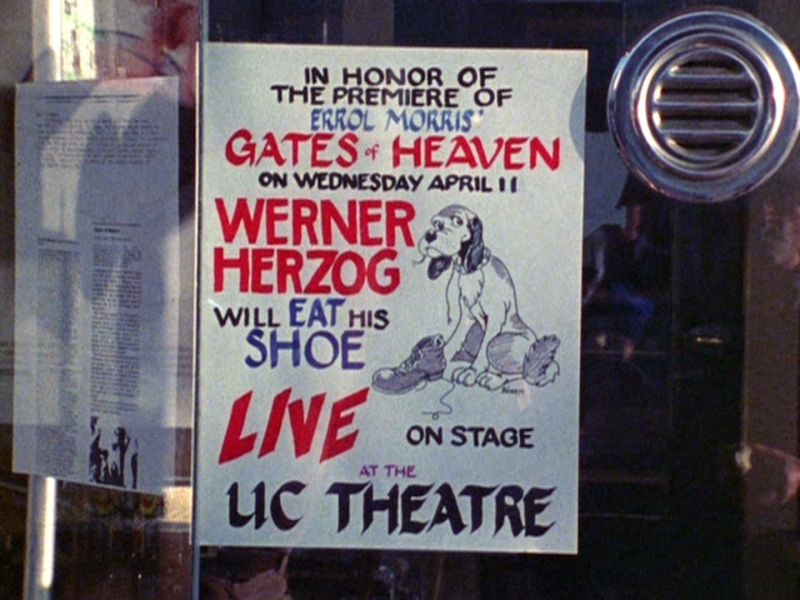 1980's Werner Herzog Eats His Shoe was directed by Les Blank, and it documents the time Werner literally ate his shoe in front of a live audience. He promised his former student Errol Morris that if he ever completed his first feature, he'd eat his shoe. And Errol did, so Werner did. It's not a great film, but it's amusing, feeling more like a DVD extra than a stand-alone short. 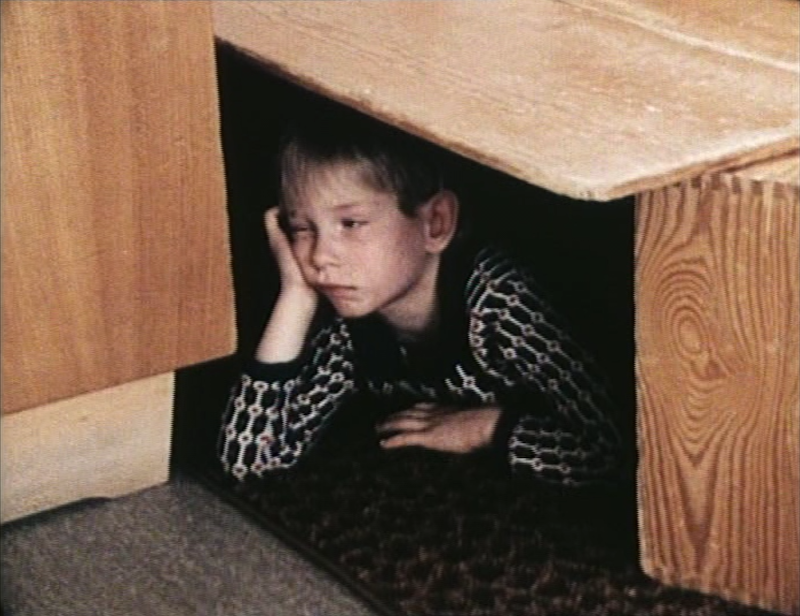 And, appropriately, it was included on Criterion's 2015 blu-ray of Morris's first feature, Gates of Heaven. Before that, Criterion had already released it on their 2005 DVD of Burden of Dreams. 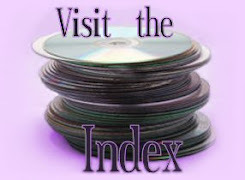 And in between those releases, it was included in the big box set of documentaries and short films sold directly through wernerherzog.com in 2006, and BFI's Werner Herzog Collection in 2014. 2014 BFI blu after that; 2015 Criterion blu last. So all of the discs seem to be using the same source except for the .com box. I mean, clearly it has serious interlacing problems like every film in that set, as we're seeing; but even apart from that it stands out for having a smeary, videotape-like transfer when even the earlier edition had a much more film-like transfer. Besides that, things are looking pretty similar. The blu-rays do offer a degree of clarity above the Criterion DVD, so we know that despite most of these releases just treating this short like an extra, they haven't merely upconverted the old master. We also see the Burdens DVD is very slightly vertically stretched at 1.33:1, where both blus present the exact same framing in 1.34:1. Neither BFI nor Criterion bother adding subtitles or alternate audio options, but the .com box does throw in optional Italian subs. 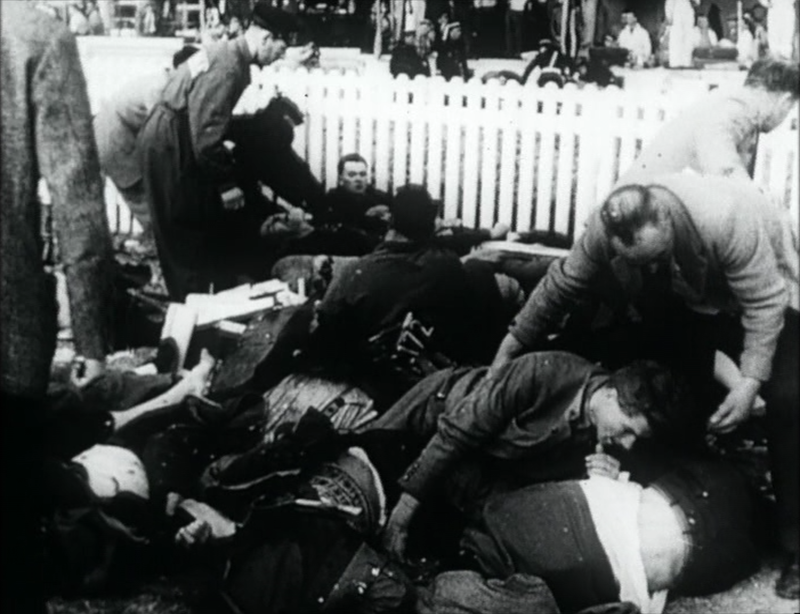 Next, we have a bit of a minor documentary work: Huie's Sermon. 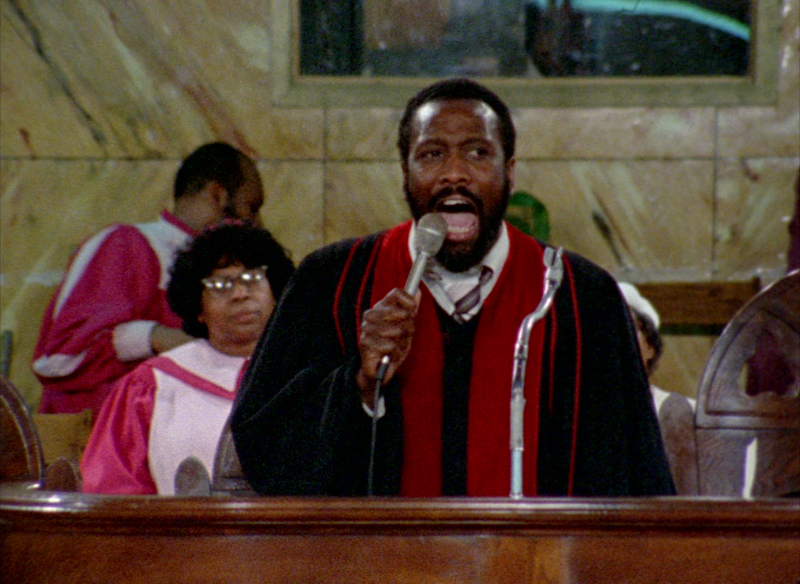 It's literally a filmed presentation of a sermon by a pastor named Huie Rogers in Brooklyn. The camera is mostly locked in a single shot with the entire 45 minutes i presented nearly unedited except for a couple shots of people entering and leaving the church at the beginning and end. The camera also moves at a few points when Huie starts moving out of shot, and makes a few cuts and creative decisions towards the end. But basically your appreciation of the film will depend entirely on how fascinated you are or aren't by Huie's sermon. If you are, you'll be happy to know that, besides being included in the .com box, it's one of the shorts BFI remastered in HD for their blu-ray set. 2006 .com DVD top; 2014 BFI blu bottom. Seriously, the interlacing in the .com box is so distracting, it's hard to even notice all the other improvements made by BFI with their new 2k scan besides that one, drastic fix. But it's all here. The color correction is massive and very welcome, and detail and grain are certainly clearer and more natural. The aspect ratio is also fixed from 1.30 to 1.37:1, pulling in a few extra slivers of information. BFI has breathed new life into this film; it really pops now and feels authentic. They don't bother with any subtitle options or anything, though, while the .com box provides optional German subs. Now here's a great, little documentary. 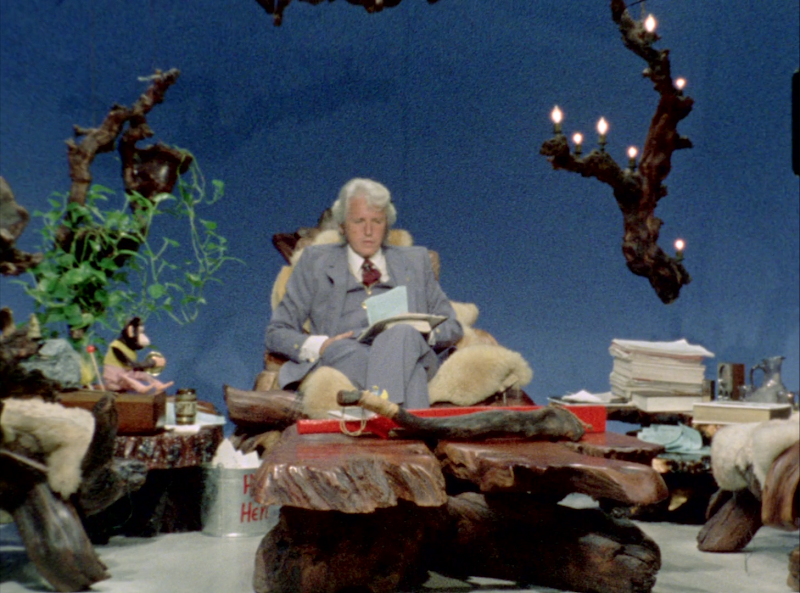 God's Angry Man is a terrific look at a real eccentric: televangelist Gene Scott. Werner interviews him at his home, meets his parents, and gets behind the scenes of his television show. That's about half the film, and the other half is direct footage of his live broadcast where he screams at his viewers for not donating enough money and declares war on the FCC. This film was made the year before Fitzcarraldo, and I wonder if Scott wasn't an influence on that character. Anyway, God's Angry Man long proliferated on bootlegs before appearing in the .com box, and eventually BFI's collection. I was really excited to get this one restored in HD, even more than many of his features. BFI's new scan totally revitalizes this movie. 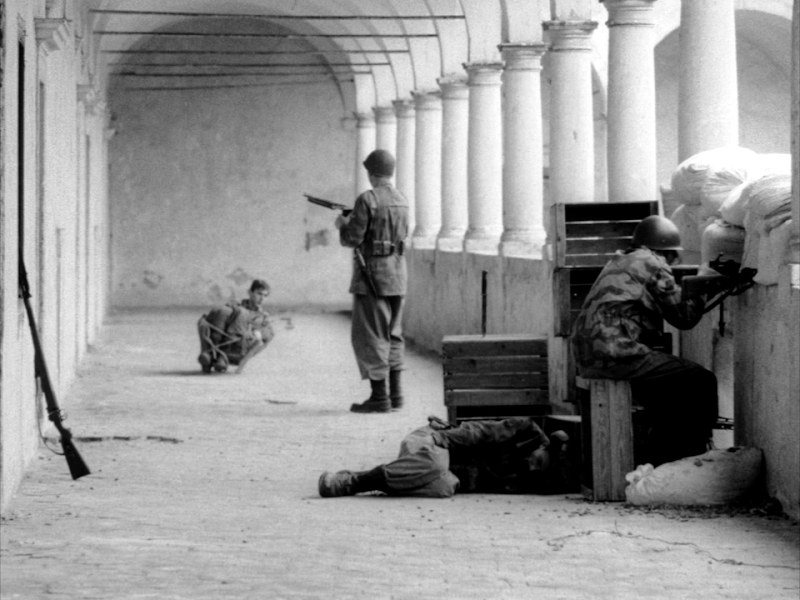 Just to clarify, all the BFI shorts came from 35mm negatives except The Unprecedented Defence of the Fortress Deutschkreuz, Handicapped Future, The Great Ecstasy of Woodcarver Steiner, Huie's Sermon and God's Angry Man, which, according to the booklet, "were scanned in 2k from the best available 16mm negative, 16mm reversal positive and 16mm print materials." We're not told specifically which of those came from the 16mm negs, reversal positive or print materials, though. But whatever they used here looks great, finally ridding of us the dupey, washed look of the previous edition (and, of course, that interlacing). The DVD is also a bit vertically stretched at 1.29:1, which the blu brings down to 1.35:1. It does find a sliver of extra picture on the top and left sides, but most of that difference is just un-squeezing the image. 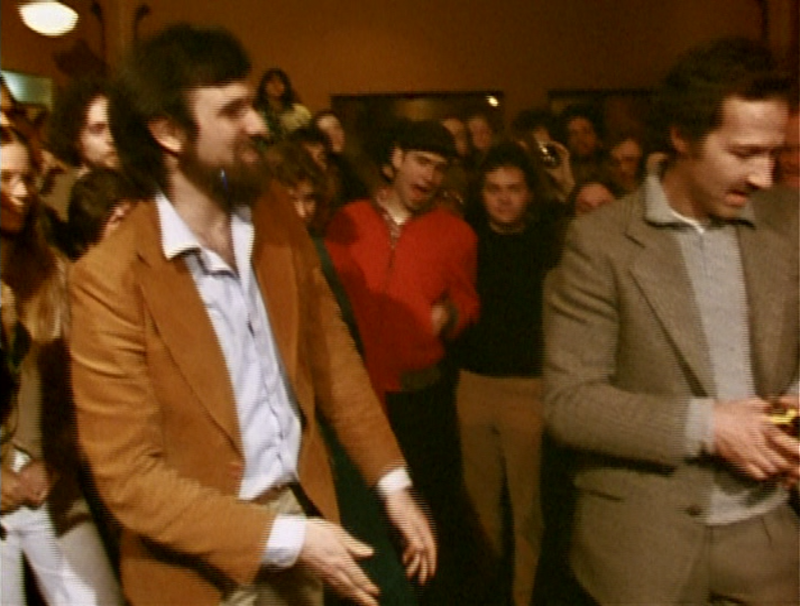 The colors are lavishly restored and grain is on the light side at times, but it's far more filmic than the old DVD. 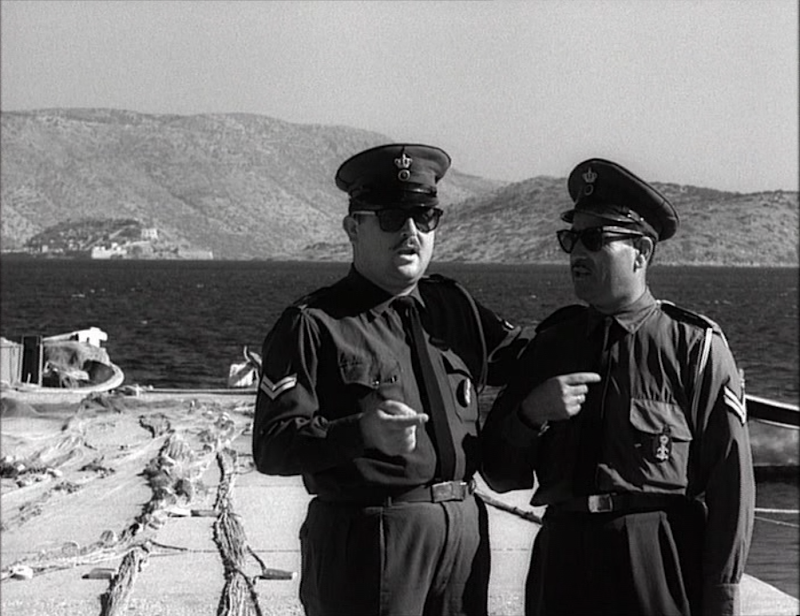 The sole advantage of the DVD is that it offers optional English and Italian subtitles, which BFI neglects. Speaking of BFI neglecting things, they completely left this next short out of their Collection. But thankfully, Shout Factory take the lead and give us a new HD transfer of Ballad Of the Little Soldier, which had previously only been available in the .com/ Shock boxes and one of those New Yorker DVDs (there were apparently two total, by the way, each with three shorts). 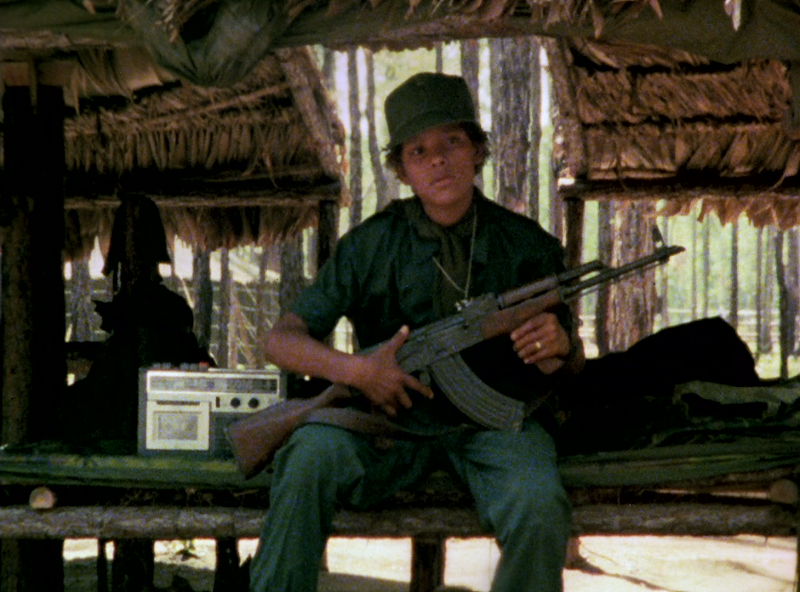 Ballad's a heart-wrenching documentary about the the ravages of war in Nicaragua including, yes, a close look at the children who were routinely pressed into combat. 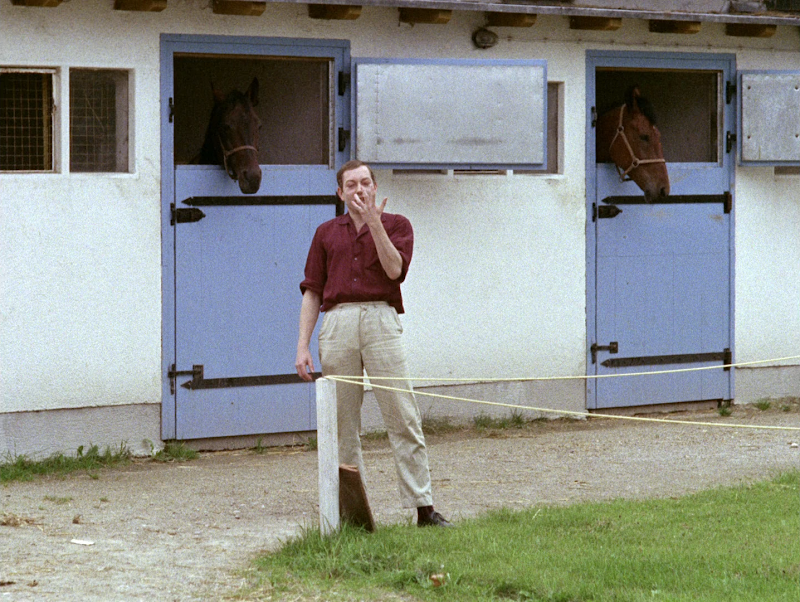 The film was started by journalist Denis Reichle and completed by Herzog, but still, unlike some of his early documentaries, you still feel his creative imprint on this one. 2006 .com DVD top; 2014 Shout Factory blu bottom. Like with BFI's HD restorations, Shout Factory has clearly given this film a brand new scan that transforms the faded, yellowed transfer we had before into a real, living movie. The image is surprisingly clear and the colors are fresh and distinct. Whites are actually white, and of course the interlacing is corrected. The framing has been pushed slightly to the left, and the slightly vertically squeezed image has fixed from 1.29:1 to 1.35:1. 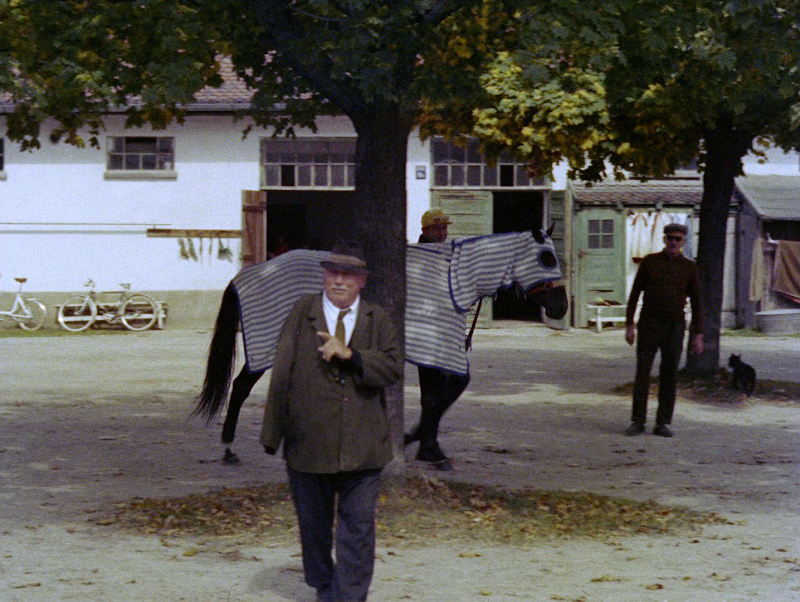 It's not all perfect, though, because there seems to be a little black crush, that has plagued a couple of the films in Shout's Collection (see, for example, The Enigma of Kaspar Hauser). You'll notice it more in the previous shot of the child soldier than the comparison; but it still blows what we had before out of the water. Both editions give us the option of either the English or German audio versions, but only Shout Factory goes the extra distance and provides optional English subtitles. 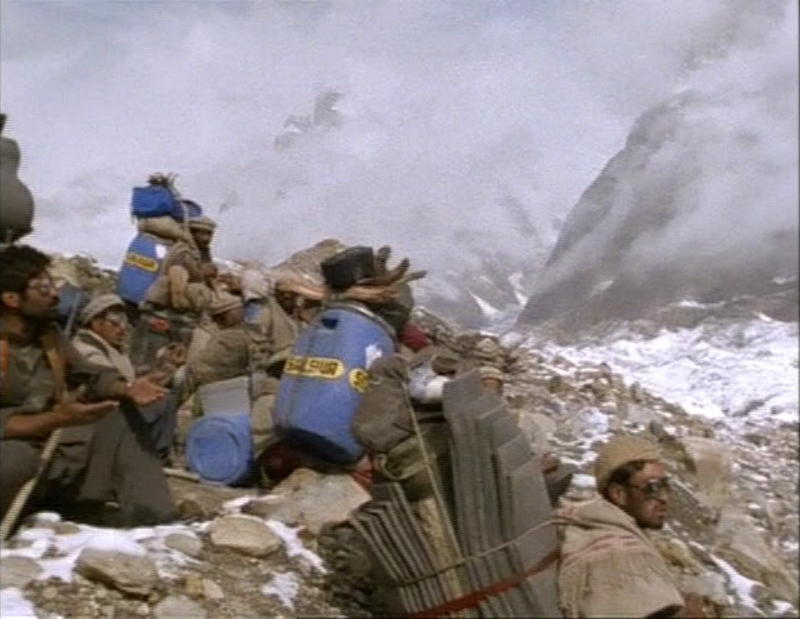 That same year, Herzog released The Dark Glow Of the Mountains. It follows two German mountain climbers who lead a team on an excessively arduous ascent, with Herzog bouncing back and forth between interviews seeking to understand their motives and the sort of exotic location footage only Herzog would go out and get. 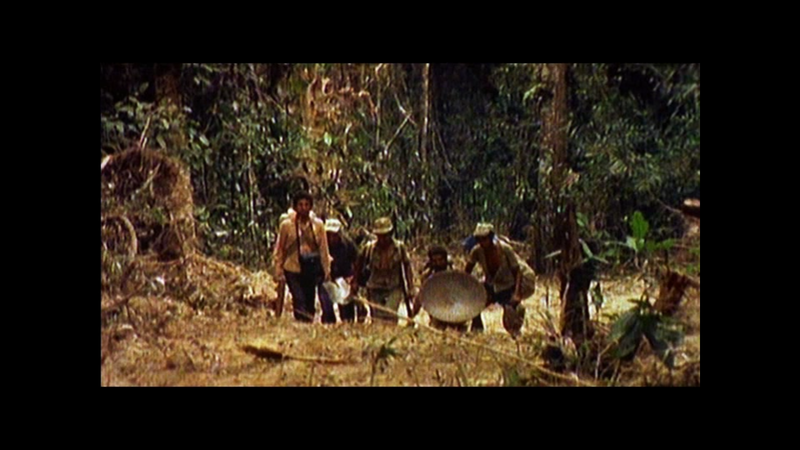 It's an evocative combination of Herzog's interview style and impressive shots set to Popol Vuh's distinctive music. I've only got it on that .com box, but it was also available on one of those New Yorker DVDs, which makes sense as this has more of a broad, crowd pleasing appeal than a lot of his earlier, eccentric shorts. It's not too bad, apart from the interlacing. Grrr! Have I mentioned that yet? Otherwise, it's standard def, of course, with softer detail and the colors could really stand to be refreshed. And that 1.29:1 aspect ratio has got to be too skinny. 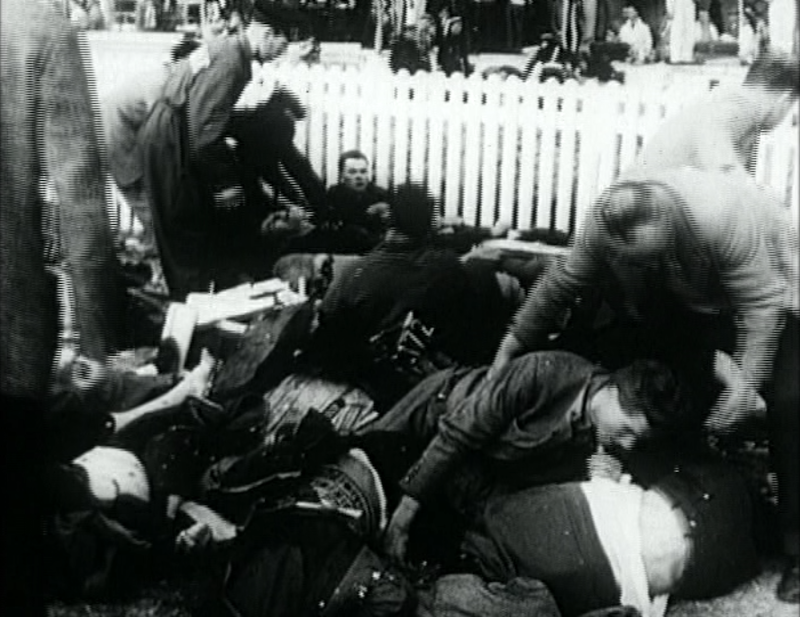 But it's a mix of 16mm and Super 8 footage, so it probably couldn't look all that much better, right? That's at least what I like to tell myself since there's no blu anywhere on the horizon. The .com box offers us the choice of English or German audio, but there's no subtitle option, so it's not that much of a choice really. This next one I've talked a bit about before, in my coverage of Woyzeck extras, but it deserves to be properly explored here. 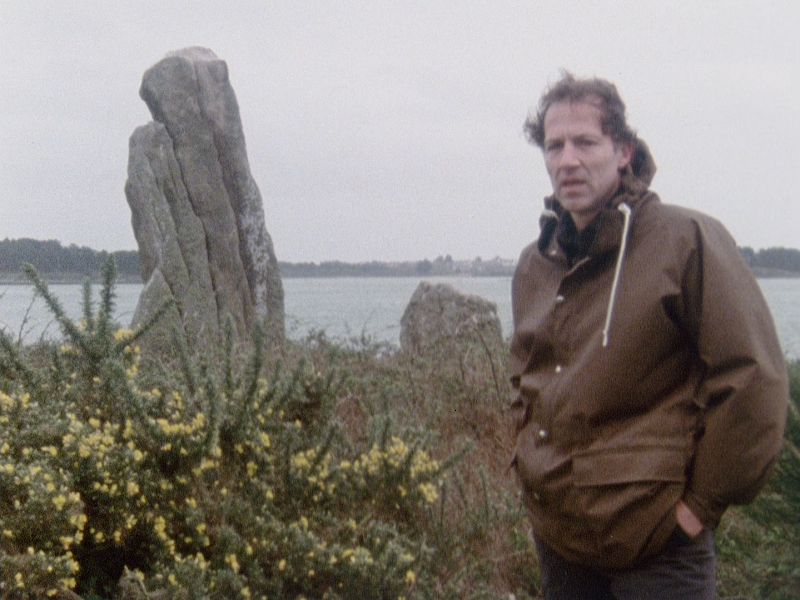 Portrait: Werner Herzog is a supposedly (we'll get into why in a sec) 1986 autobiographical doc. Herzog films himself where he grew up and on the locations of some of his films, talking about his experiences and showing clips from his films. 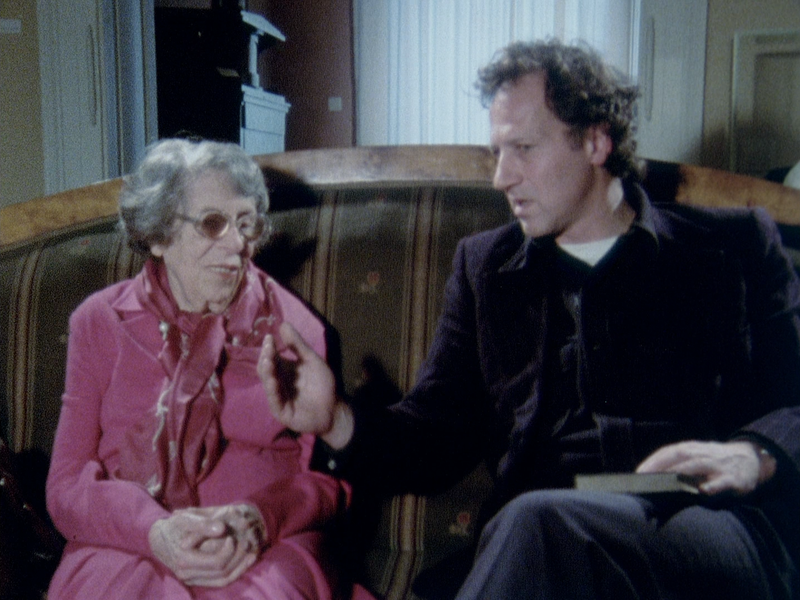 He interviews Lotte Eisner, a patriarch of German cinema and generally shares some great little insights. It's in the .com box and presented in HD in Shout Factory's collection, although given the source material, it's not a great distinction in terms of PQ. 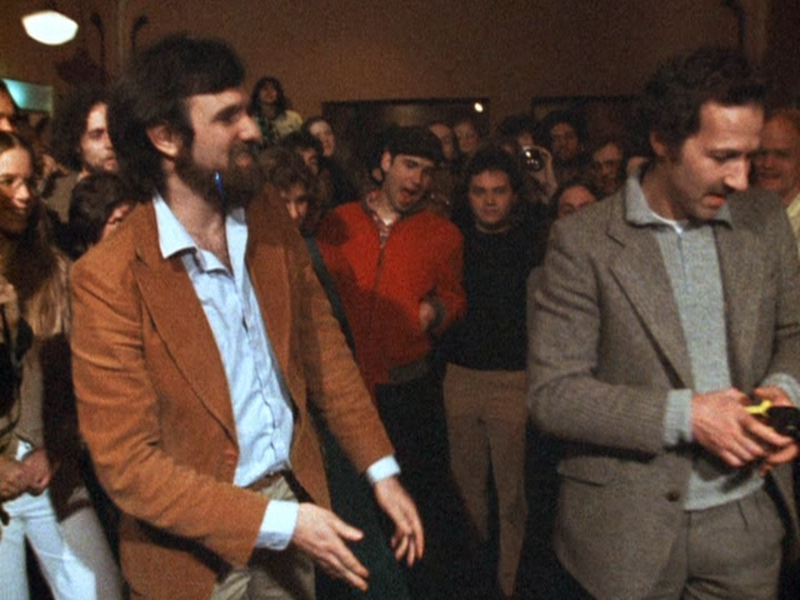 But then there's The South Bank Show: Werner Herzog, that was featured in BFI's collection. So, basically it's an hour-long episode of an ITV show, in this case one entirely focused on presenting a biography of Herzog, with direction credited to Jack Bond. But if you watch this and Portrait back to back, you'll notice it's pretty much all the same footage, re-edited, except South Bank has even more footage (after all, it's almost a half hour longer). But the same self-interviews of Herzog visiting his locations are presented here, so is the Eisner conversation. And yet, this episode apparently aired in 1982. 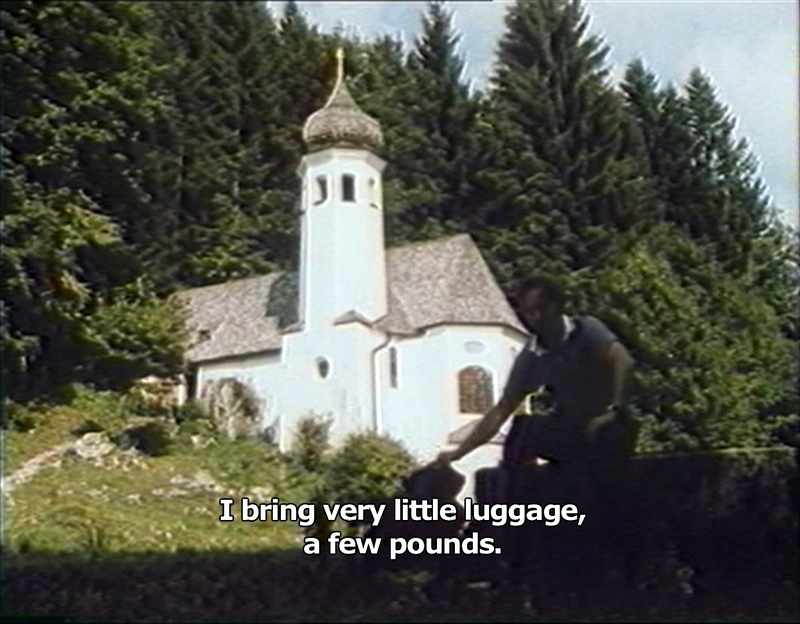 So... Herzog shot all this stuff, then lent it to ITV for their show, but didn't use it for his own film until four years later? 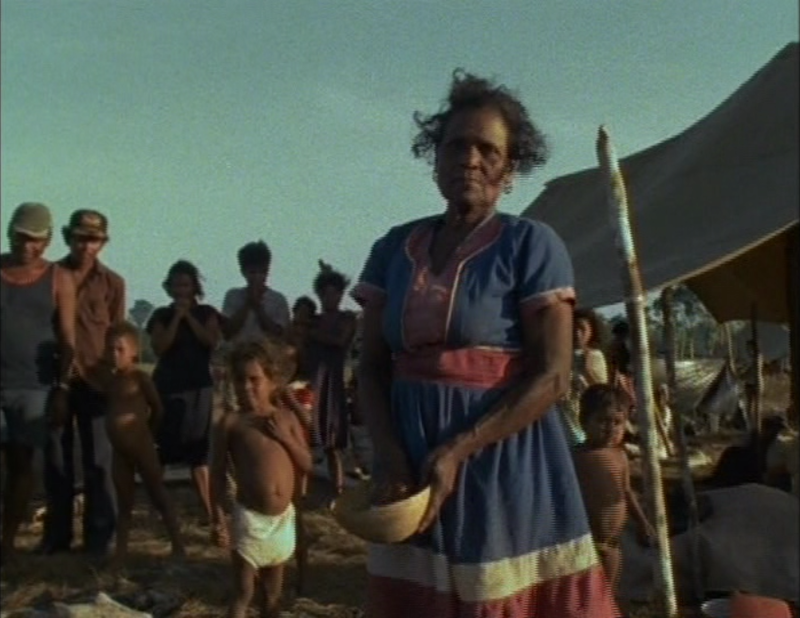 Or Herzog crafted Portrait out of footage mostly shot for South Bank? I'm a little confused, but anyway, the end result is the same: Portrait is a shorter, cut-down version of this. There is a tiny bit of material unique to Portrait (Herzog talking in front of a church near where he grew up), and a lot of unique material in South Bank (from Herzog playing soccer with his team to a candid interview with his ex-wife). So both have value, but South Bank is definitely the richer of the two. 2006 .com DVD top; 2014 Shout Factory blu mid; 2014 BFI blu bottom. See? The difference in getting Portrait in HD from Shout is negligible, except that at least means they fixed the interlacing, which is nice. But otherwise, they both look like mud, with a 1.30:1 aspect ratio including a big strip of dead space along the right hand side. But clearly ITV had a high quality source, because wow, what a difference in the same footage from The South Bank Show! Sure, it's grainy and a little light on detail, which is surely down to the quality of the original film. 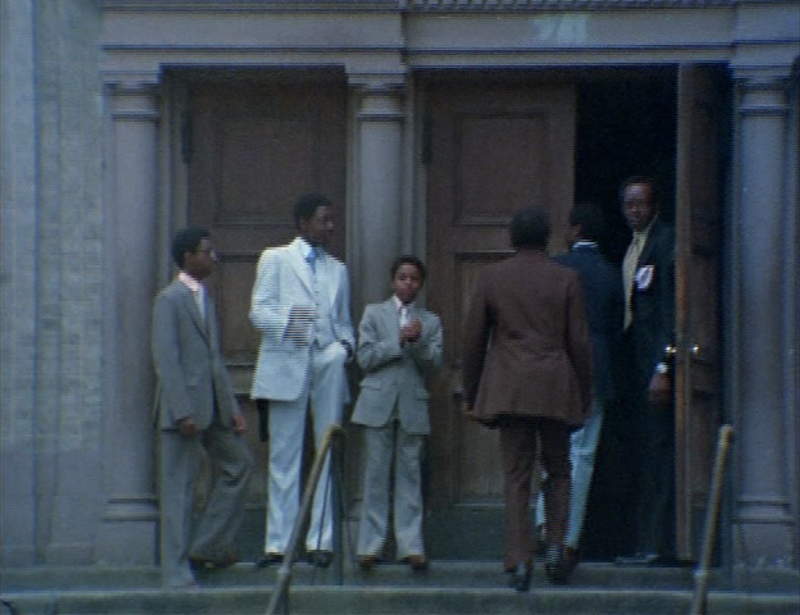 But at least this looks like film, with natural grain, authentic colors, and the image unsquished back to 1.33:1. All three versions include English subtitles, but Shout Factory loses a couple points for burning theirs into the picture. If you're a completist, sure, you need both films. After all, both have at least a little unique content, and there's some importance to Portrait in that it's how Herzog presented the material himself. But for 95% of the population, I'd just recommend picking The South Bank Show episode and not even worrying about Portrait. 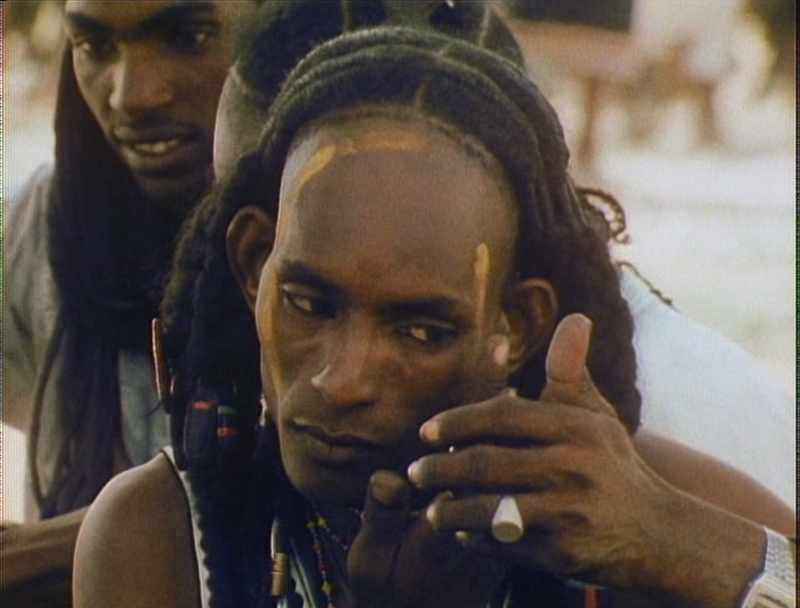 We leave the 80's with one last short, Wodaabe: Herdsmen of the Sun. The Wodaabe are a small, nomadic tribe who live in the Sahara. We're told they consider themselves to be the most beautiful people in the world, and this is demonstrated by their elaborate beauty contest-style courtship rituals. And yes, they also herd some pretty exotic animals. It's all pretty fascinating. The only other place I've seen this one pop up besides the .com/ Shock boxes is as an extra on the German, 2005 Art Haus DVD of Where the Green Ants Dream, which yes, is generally English friendly. 2005 Art Haus DVD top; 2006 .com DVD bottom. Well, they're clearly using the same master for both, which isn't a good thing. It's ugly, flat and full of visual noise, not looking much better than a VHS tape. It reminds me of those old PBS DVDs that looked like we were watching their programs through a screen door. I'm calling the aspect ratio 1.32:1, but there's so much crap along the edges of the picture, it's hard to determine exactly where the picture ends and the random video junk along the edges begins. The only difference between the two discs is that Art Haus doesn't have the interlace combing, making it the preferable option. But clearly a restoration is in order here. Both discs give us the choice of listening to this with the English or German narration (both spoken by Herzog), but they both have burnt in English subtitles regardless. If you're getting sick of hearing about the .com box, don't worry, we've come to the last one from there. But hey, don't knock it; it (and the Shock version) is the only place some of these wonderful films have been made available. 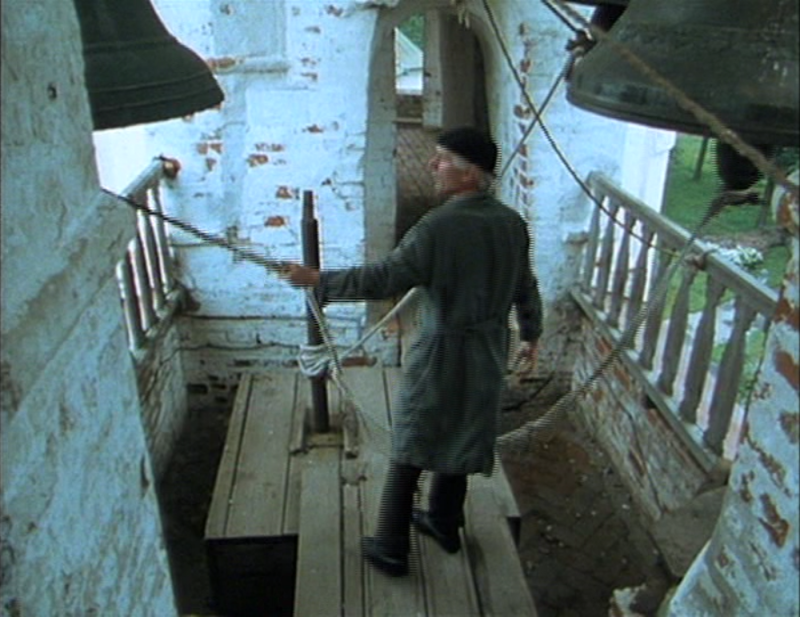 1993's Bells From the Deep finds Herzog in Russia, talking to faith healers and pilgrims, looking for a lost city, supposedly saved by God from invading forces by the prayers of the devoted. The titular bells can supposedly be heard emanating from the sunken city below. 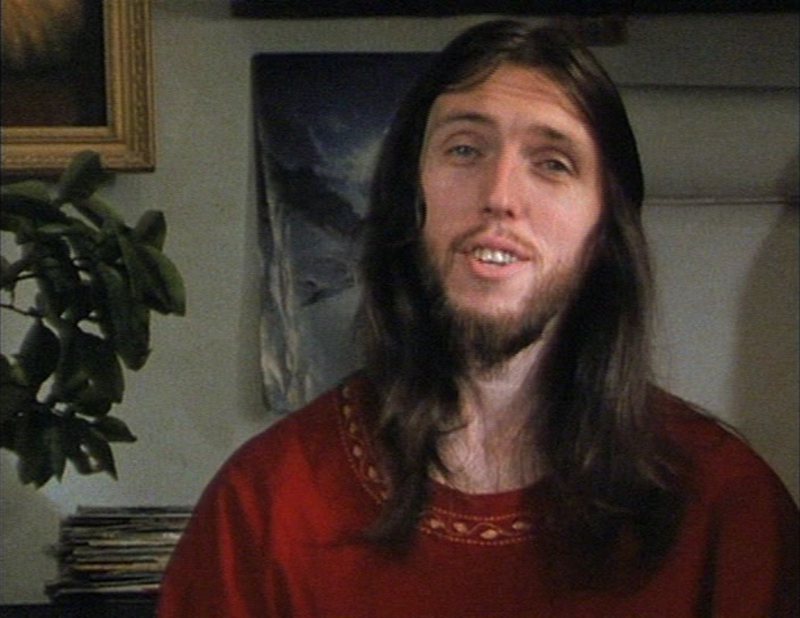 Jesus Himself even comes and talks to us! You know what to expect at this point. Fullscreen at 1.30:1, slightly faded and tragically interlaced. Being a more modern, yet pre-digital, flick, it does hold up better than some of the older ones, with somewhat bolder, more distinct colors and image separation. But it sure ain't high def. We're given both the English and German audio versions, though our only subtitle options are (removable) Italian ones. So, we've finally worked our way through the Documentaries and Shorts box (though there are other feature-length docs still on there), but we've still got one last short film. 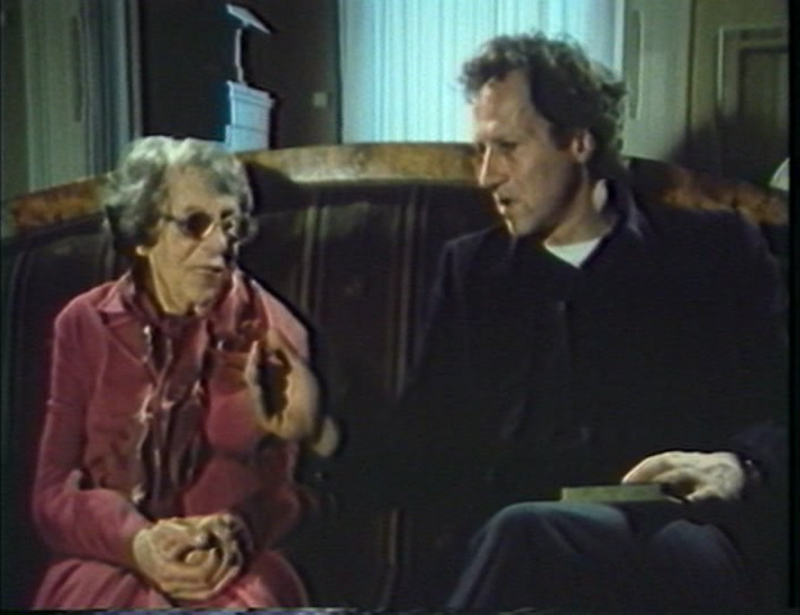 In 2002, Werner Herzog made Ten Thousand Years Old as part of a series of 10 minute short films by various celebrated filmmakers for a series called Ten Minutes Older, based on a famous Russian short. 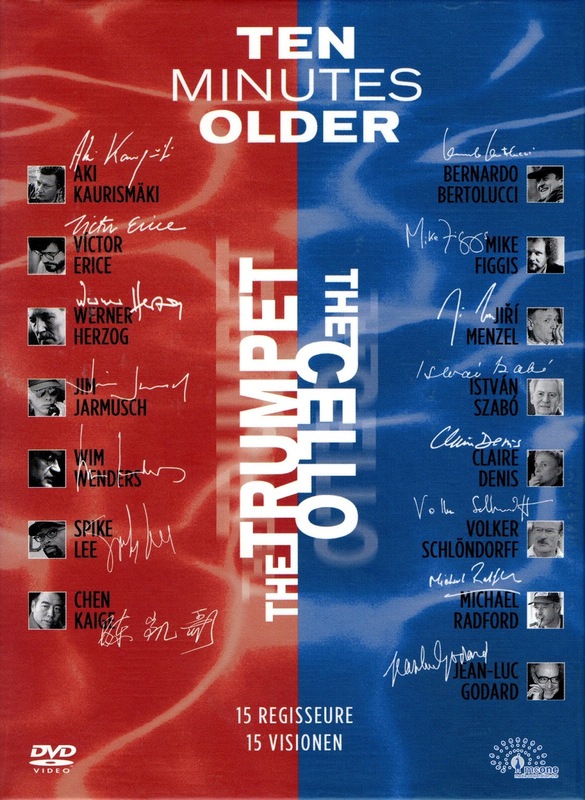 They're divided into two, roughly 90 minute chunks labeled The Cello and The Trumpet, which I think only refer to the brief muzak clip they play between each short. Honestly, they're mostly pretty disappointing. There are some really enticing filmmakers in the line-up, from Wim Wenders to Bernardo Bertolucci, even Jean-Luc Goddard. But there's just so little substance to most of them, they range from mediocre to downright poor. One of the best is Spike Lee's brief documentary on the Florida recount in the Gore/ Bush election, and even then, it doesn't do much but lay down all the facts before it ends. There's no dramatic weight to it or anything. So Herzog's stands out as easily the best. 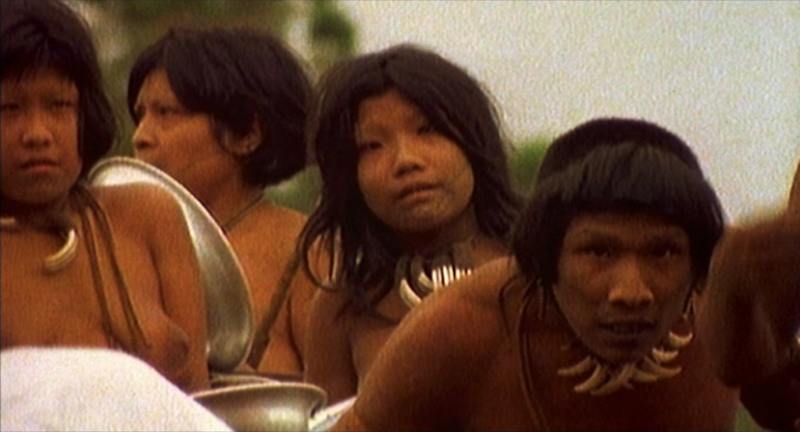 It's a documentary about a small Brazilian tribe called the Amondauas who were thriving until they came into contact with modern society. This was also released in the UK by Blue Dolphin, but I picked the German DVD from Media Cooperation One, because it had a 50-minute 'making of' doc and, as you can see above, claimed to be an anamorphic 16x9 presentation. 2004 Media Cooperation One DVD. Unfortunately, that turned out to be a bold-faced lie. 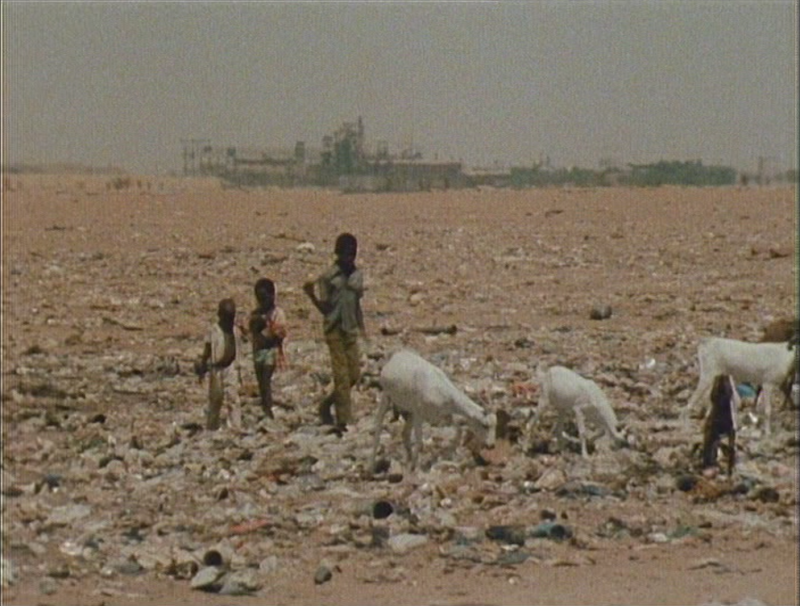 All the shorts, including Herzog's, are given a widescreen 1.85:1 presentation, clearly boxed with a 1.33:1 frame. So it's surrounded by wasted negative space on widescreen TVs, and consequently crushed to a lower resolution. As in, non-anamorphic. I mean, just look at that! It's not interlaced, but it's pretty shoddy. We're given the option of Dolby 2.0 or 5.1 mixes, with removable German subtitles. The 'making of' was not a lie, at least, but it only covers some of the shorts, and the Herzog film is not one of them. So another disappointment. There's also a photo gallery, two official trailers (one of which is over six minutes long) and an extensive collection bonus trailers, plus an attractive, 32-page booklet, though the text is all in German. So it would be great to see the rest of these DVD-only titles get HD restorations, wouldn't it? Some more than others, admittedly. 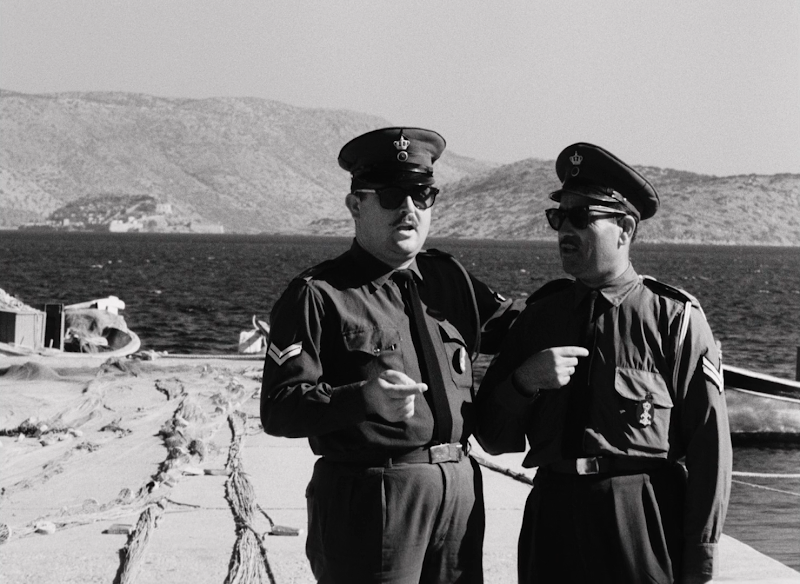 And there are a couple of shorts, including 1964's Game In the Sand (which Herzog has said he will never show to the world, so let's not hold our breath on that one), his "The French As Seen By..." film Les Francais Vus Par, and 2009's very short La Boheme, made for Sky Arts' opera channel, none of which haven't come out at all. It's surprising how much more work is left to do if we're to get his complete catalog restored and released in proper editions. Hopefully somebody's got their eye on that ball, maybe a second box from Shout or BFI that would include many of his features still missing in HD, too? 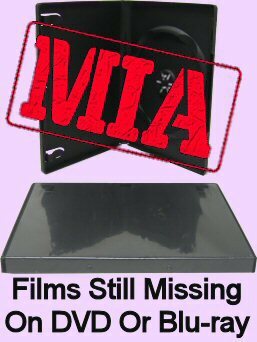 Maybe Kino could start scooping these up, and pair up one short with one full-length film for single-disc releases of his remaining work? Or Arrow could jump in and compile a massive box. I'm just spit-balling here, but hopefully somebody does something. We've taken some good steps so far, but there's a long way to go. So we've been chugging our way through The Werner Herzog Collection from BFI and Herzog: The Collection from Shout Factory, but now it's time to address the really complicated situation of Werner Herzog's short films. Between the two aforementioned sets, the BFI has substantially more short films than Shout's, and it's lovely to see them cleaned up and presented in HD often for the first time. But even the BFI set certainly doesn't include them all, something I'm going to get ambitious for today, and hopefully cover every single one of his short films that are available on disc to date... most of which, as the above image indicates, can be found in the big boxed set that comes direct from Herzog's own site, if nowhere else. 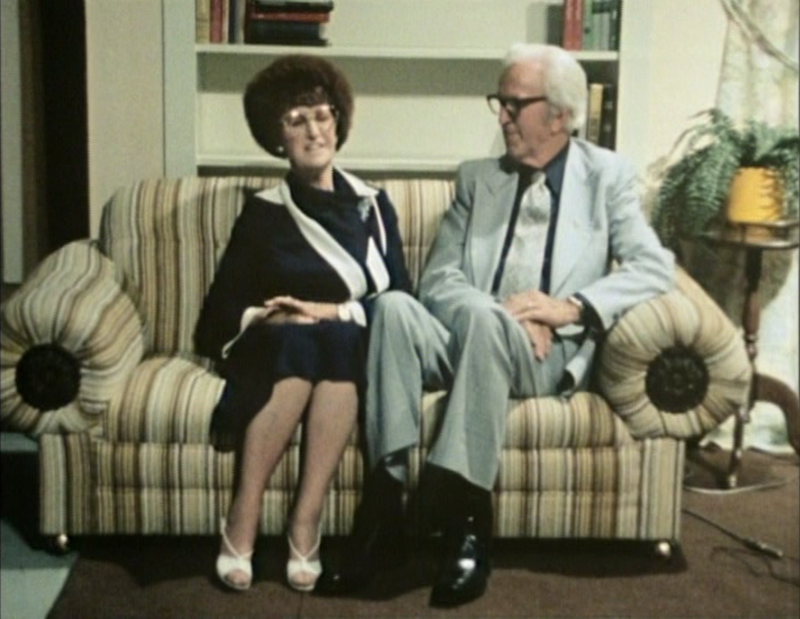 Several early shorts were also included as extras on Raro's 2-disc DVD of Signs Of Life. And quickly, before we take this deep dive, I'll just point out that I've already covered two of his short films already. 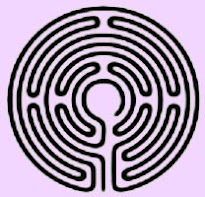 So just follow the links to read about Christ and Demons in New Spain, Gesualdo and Pilgrimage. But for now, let's begin at the beginning. Let me start us off with a personal opinion, if you'll indulge me. 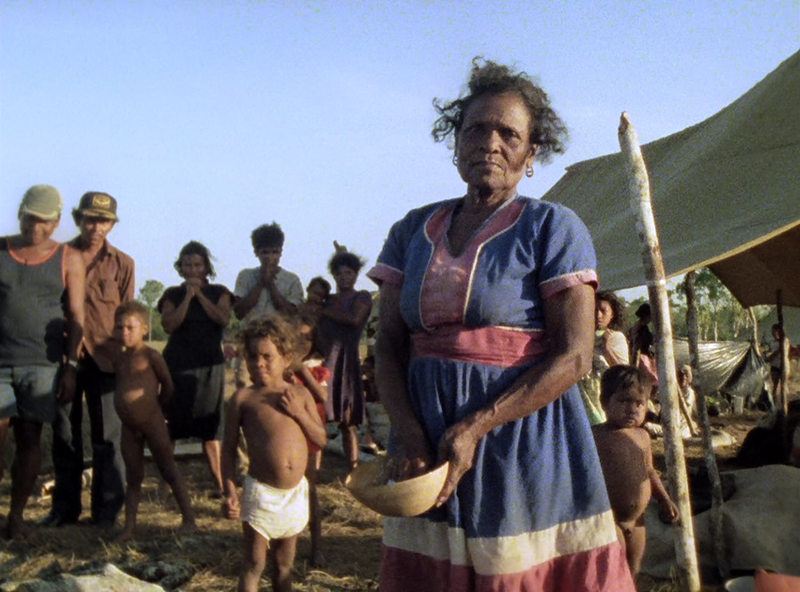 Some of Herzog's short films are truly compelling films that stand up right alongside his feature work. And others... hold their value as curiosity pieces, early steps or experiments of a talented artist mostly of interest to serious fans and completists. 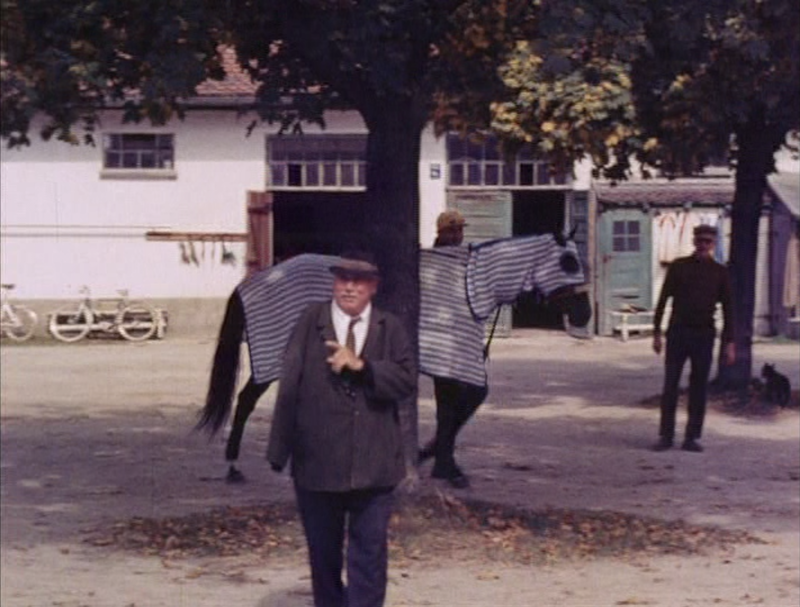 Something like Wings of Hope I'd recommend to any film fan with discerning tastes, and then there are the ones like Herakles, Herzog's first film from 1962. 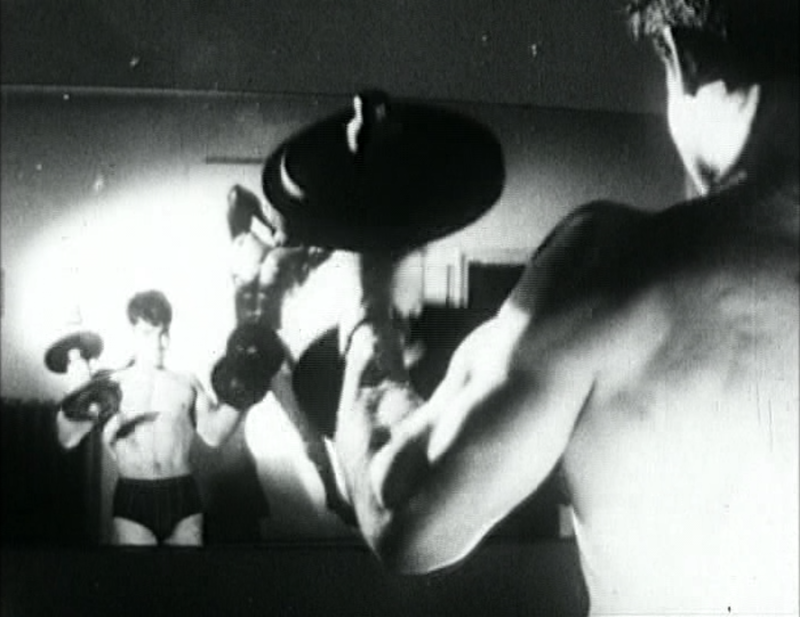 It's worth checking out because it's his first film, an intriguing mash-up of bodybuilders and stock footage, loosely suggestive of Hercules' famous tasks, all set to a heavy-handed jazz score. This is not featured on either of the blu-ray boxed sets or available in HD at all. It's in the wernerherzog.com box, though (and the 2009 Australian version of that box from Shock), and Raro's DVD. 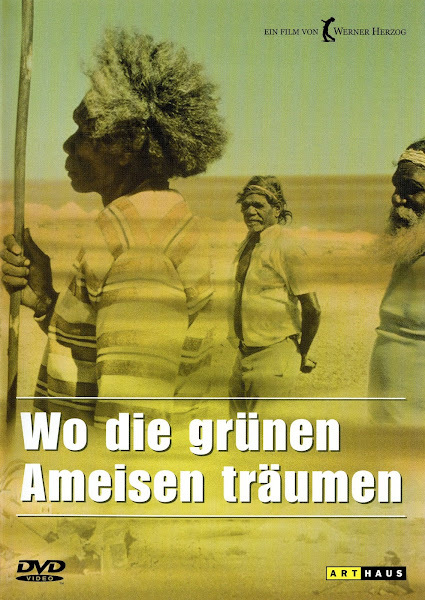 2006 .com DVD top; 2009 Raro DVD bottom. There's a pretty big distinction in these screencaps. They're both standard def, 1.30:1 presentations of some pretty rough looking source material. That can be put down as much down to this being Herzog's only 16mm effort, though (all his subsequent shorts are in 35... or eventually digital). Anyway, the Raro disc cleans up the destructive interlacing, which makes it the far more attractive of the two. This is a silent film, apart from the music, so there's no question of language tracks or subtitles. Really, the interlacing is the only important distinction between the two discs, but boy does it make a difference. 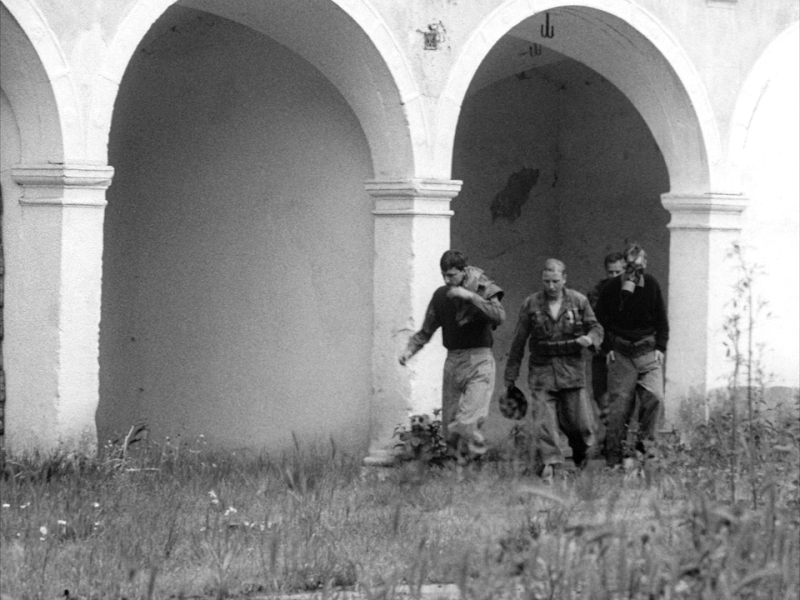 Next, we come to The Unprecedented Defence of the Fortress Deutschkreuz, a kooky student film-like effort where four young men wander into an abandoned fortress and take up arms to defend it from... nobody. It's essentially another silent film, except this time with narration in addition to the music, all playing over a montage of the quartet performing absurd military maneuvers. It's sort of a satire of mankind's penchant for war-mongering and sort of a dream experience. This one is available on blu, in the BFI set, as well as in the Herzog/ Shock boxes and that Raro DVD. 2006 .com DVD top; 2009 Raro DVD mid; 2014 BFI blu bottom. In addition to boosting this film to HD with a new 2k scan, BFI has done some serious restorative clean-up. On both DVDs, the film is full scratches and damage, both in the picture and sound. BFI tidies up both substantially. 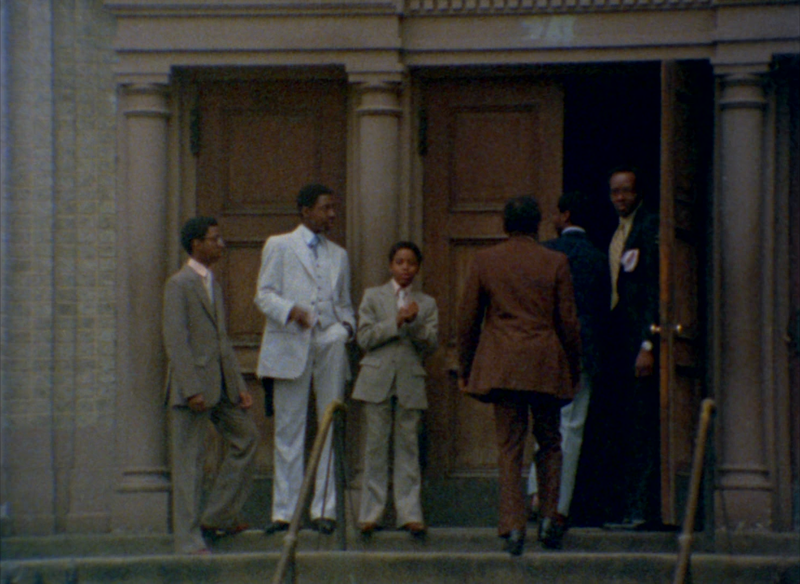 It ups the contrast a bit, giving us more genuine blacks, and has an authentic, film-like capture. It also corrects the AR from 1.30:1 to a more common 1.33:1, with slightly adjusted framing. The DVDs themselves are virtually identical except for the .com box being seriously interlaced. Get used to that; it's a consistent problem with the box. And we're not just talking one out of every six or so frames, more like every three out of five. Raro has its own problem this time, though: forced Italian subtitles burnt into the picture. If you select English subtitles, they display at the top of the screen, above the Italian subs. Neither of the other releases have that issue, simply giving you optional English subs with nothing burnt in. Still in the late 60s, we come to a strange exercise called Last Words. This was apparently filmed and edited during a break in the Signs of Life shoot. 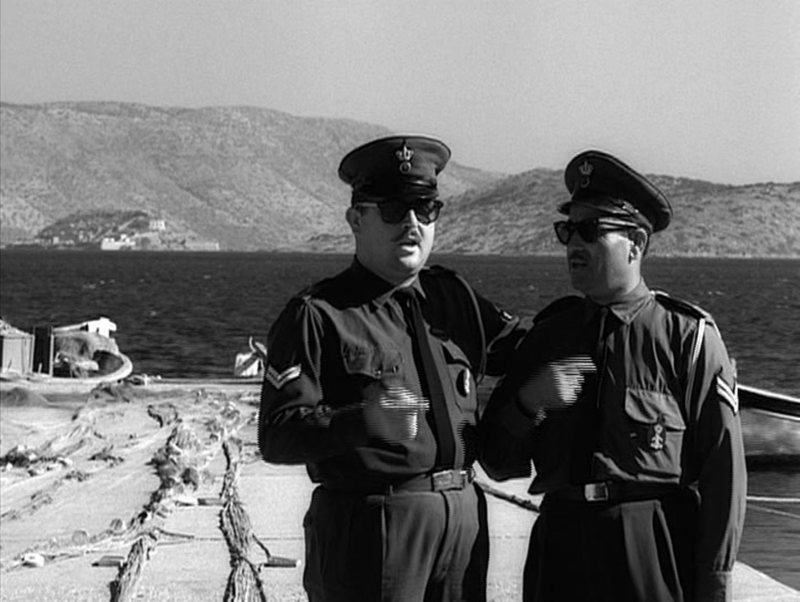 Somewhere in Greece, various characters speak directly to the camera, repeating their lines over and over, loosely telling the audience about a man who left a leper colony. This is intercut with said man playing music in a bar. What does it all mean? Who knows, but we have it in HD! Once again, this is available in the boxes, the Raro discs and BFI's 2014 box. We're gonna start burning through these, because the conditions are pretty much the same film after film. The box set version is badly interlaced. BFI's new 2k scan from the original 35mm negatives slightly widens the AR and adjusts the framing, though this time we go from the DVDs' 1.33:1 to 1.37:1. The DVDs are naturally softer with compression issues that BFI's new scan clears up for a much higher quality feel. One difference, though, is that Raro's Italian subs aren't burnt in this time. It has optional Italian and English subs, while the .com boxset has English and German and the BFI just has English. 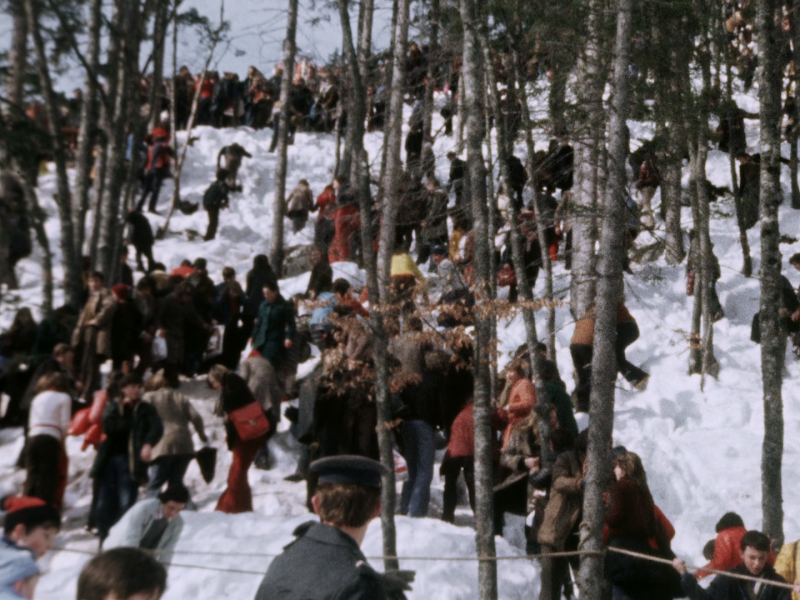 We step into the world of color with 1969's Precautions Against Fanatics, and find ourselves even deeper in absurdism. Various people stand around a horse race track and explain to the camera their jobs, all of which are insane nonsense. 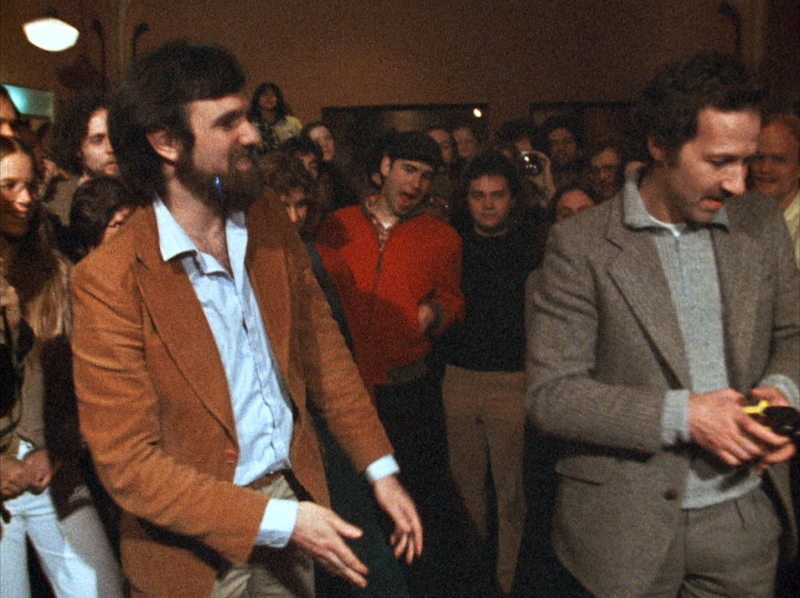 Herzog's boxset describes the film simply as an "elaborate, on-camera practical joke," possibly because the filmmakers are trespassing and spouting their crazy claims in the proximity of real employees? Is that the idea? I'm not even really sure, but it's strangely engrossing, and another one that's featured in the boxes, on Raro and BFI. There's also a long out of print New Yorker DVD of three Herzog short films, including this one, which I've never seen. This time the Raro disc is interlaced, too, and the boxed DVD is still interlaced, but not as badly (and, as you can see, different frames are affected). But who cares now that we have this beautiful new transfer from BFI? It's another 2kscan from the 35mm negs, and as you can see, the colors that were much too red on the DVDs have been corrected, more image is revealed around all four sides, and it's decidedly sharper. Once again, all three discs include optional English subtitles, while the Raro also has optional Italian ones. 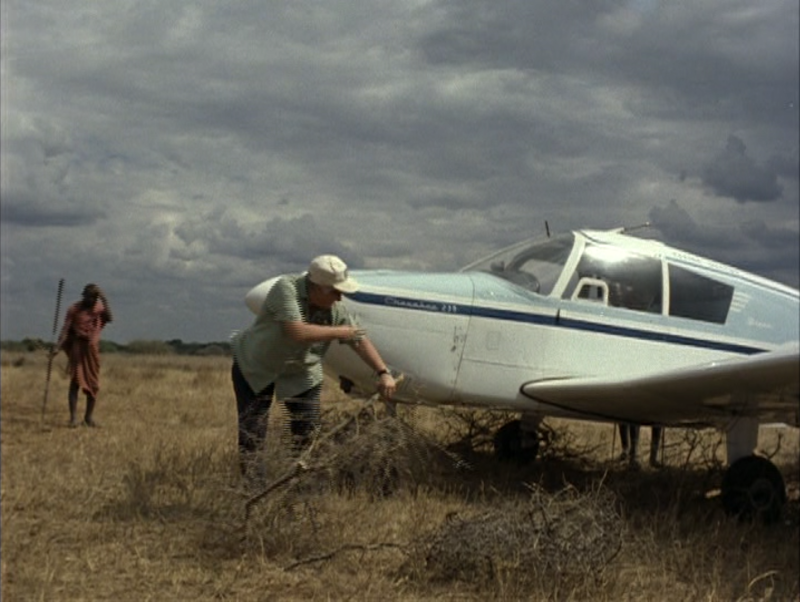 Say goodbye to Raro and BFI for this next one, however, which is a shame because I think 1970's The Flying Doctors of East Africa is a more powerful film than any we've looked at thusfar, and it would be great to get it restored on blu. I mean, jeez, when you see that tiny child who was speared through his stomach. It's a documentary, and pretty straight-forward in style even compared to his other docs (which, after all, are often quite stylized). You might point out that it was released on blu by Revolver in the UK, but the short films they put on their blu Encounters At the End Of the World blu are apparently just SD upconverts, and there is no HD master available yet. That's disappointing. It's available on a couple DVDs around the world, though, including one from Art Haus as an extra for Even Dwarfs Started Small, and in the wernerherzog.com and Shock boxes. Unfortunately, the interlacing hasn't gone anywhere. Maybe the Revolver or Art Haus discs at least correct that. Otherwise, though, the flat, 1.33:1 image is probably the same anywhere you look. It's soft and would surely benefit from a nice 2k scan, that's for sure. One nice thing about the version in this set is that it includes both the English and German audio versions, with optional English and Italian subtitles. So you can watch it either way; though I should point out that neither narrator is Herzog himself. 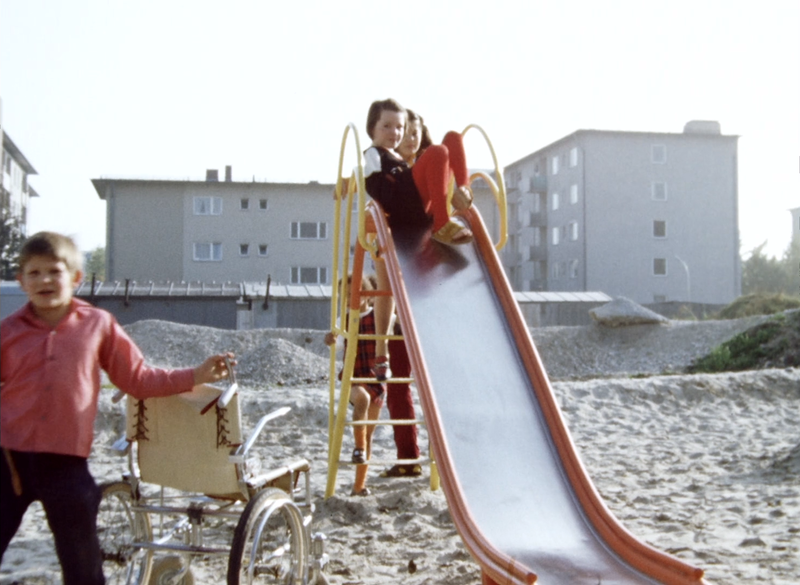 It's another serious, moving documentary short in 1971: Handicapped Future. "Future" because we're looking at children and young adults, and specifically how Germany was not well equipped to deal with their special needs as they moved on to adulthood. The last act follows one man who moved to America, because it's so much better here. The most memorable scene, however, is an interview with the mother of a young child, who seems to be dealing much worse with her son's issues than he is. 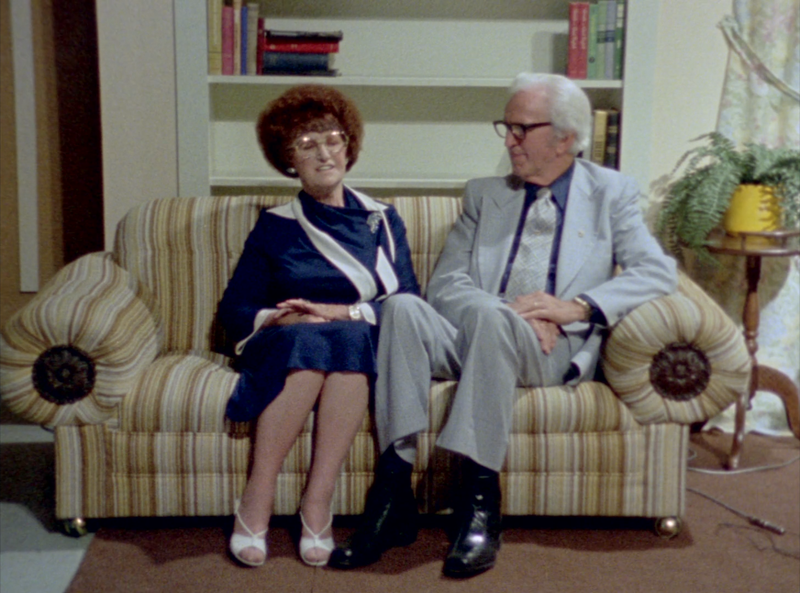 Happily, and maybe a little surprisingly, this is one of the shorts that found its way to blu courtesy of BFI. This film has a soft, handheld look to it, and BFI was only able to access 16mm print or reversal elements this time, so the gains in HD aren't quite as obvious here as they are one some of their previous shorts. Fixing up the nasty interlacing from the boxed set's DVD, sure, that's obvious. After that, though, it's a bit more subtle, with the saturation a little more muted, detail soft and smooth and grain washed away. 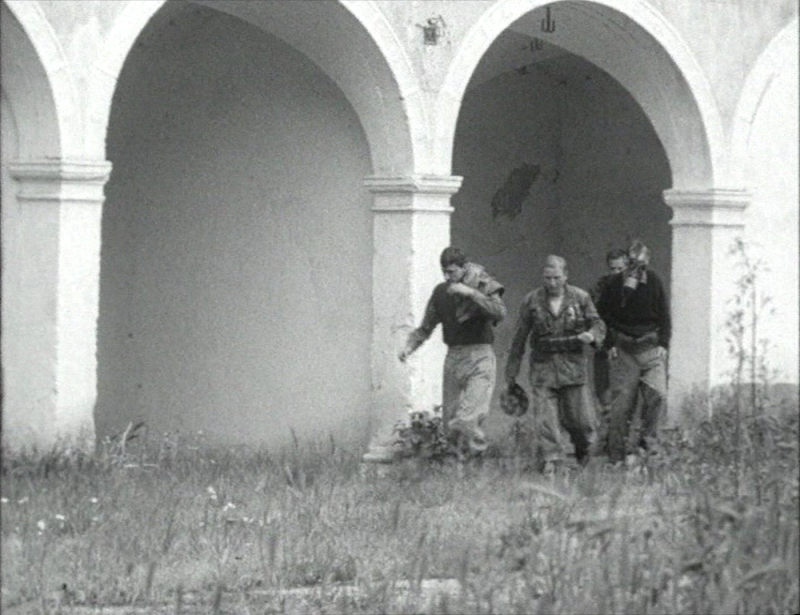 The aspect ratio is broadened out slightly from 1.33:1 to 1.37:1, and both versions offer optional English subtitles, with the DVD throwing in Italian subs as well. 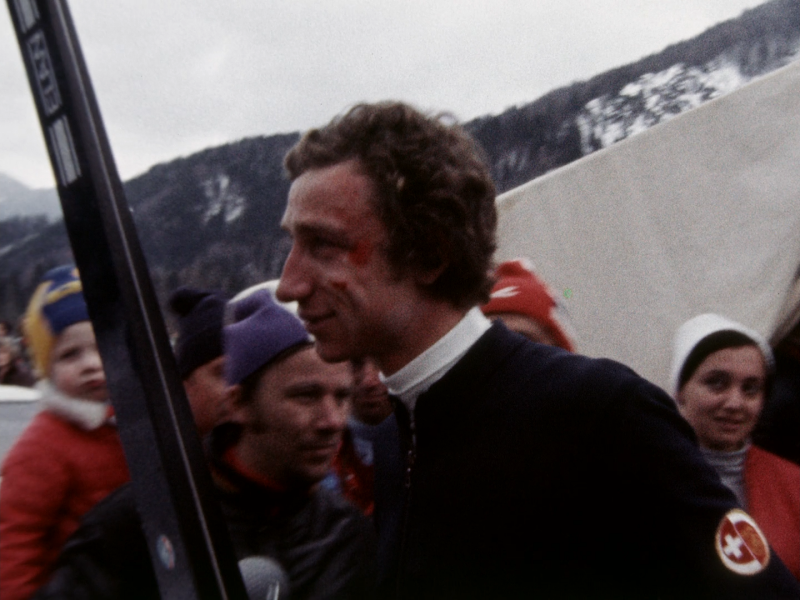 The Great Ecstasy of Woodcarver Steiner is next, and we begin to see some of the artistic flourishes of Herzog's earlier work creep into his documentaries, in this case a lot of pensive, slow motion shots of high flying action set to the music of Popol Vuh. 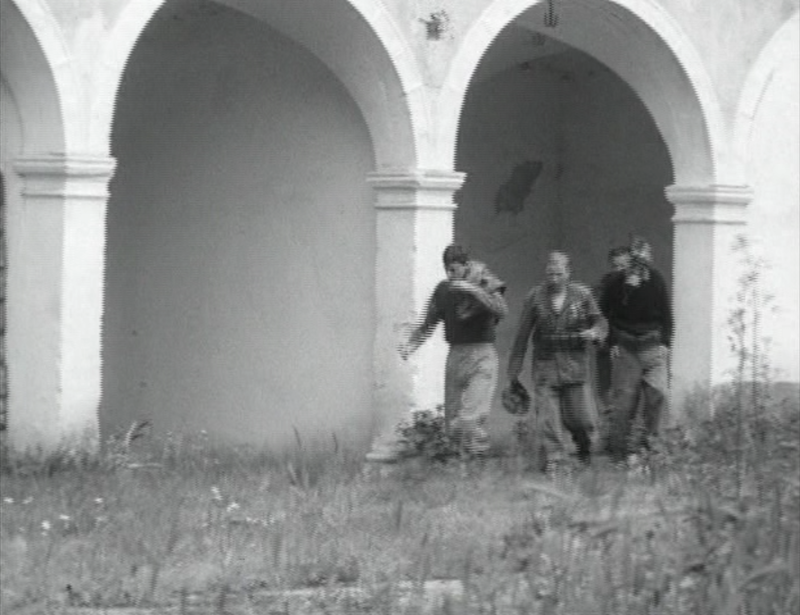 Yes, this their first Herzog short. We also see Herzog step in front of the camera, which he wasn't doing in his earlier work, but of course is quite famous for now. 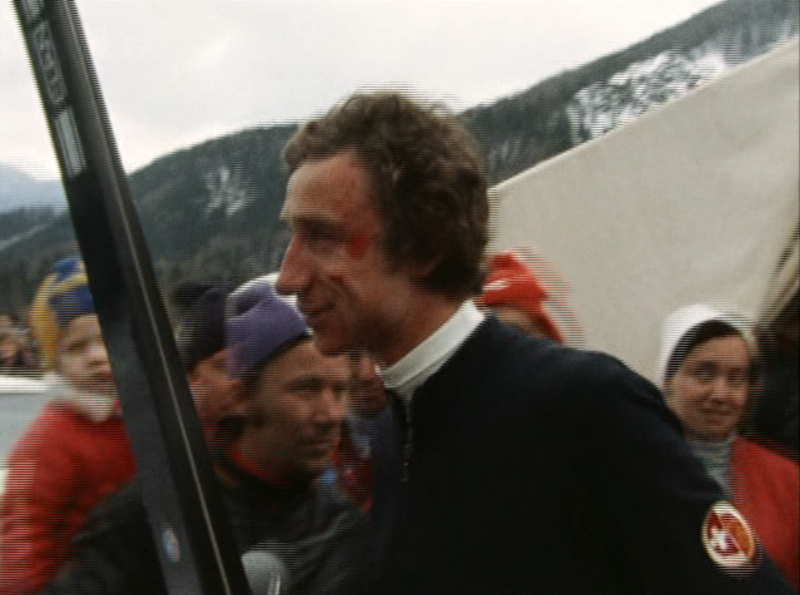 Walter Steiner is an Olympic ski jumper, who yes, also works as a woodcarver. Here we see him break records and nearly break his own body jumping to very dangerous lengths, to the point where he handicaps his starting point just to stay alive. Again, this one's in the boxes and the BFI set, though it's also apparently on another one of those rare, out of print New Yorker DVDs that go for hundreds of dollars online. 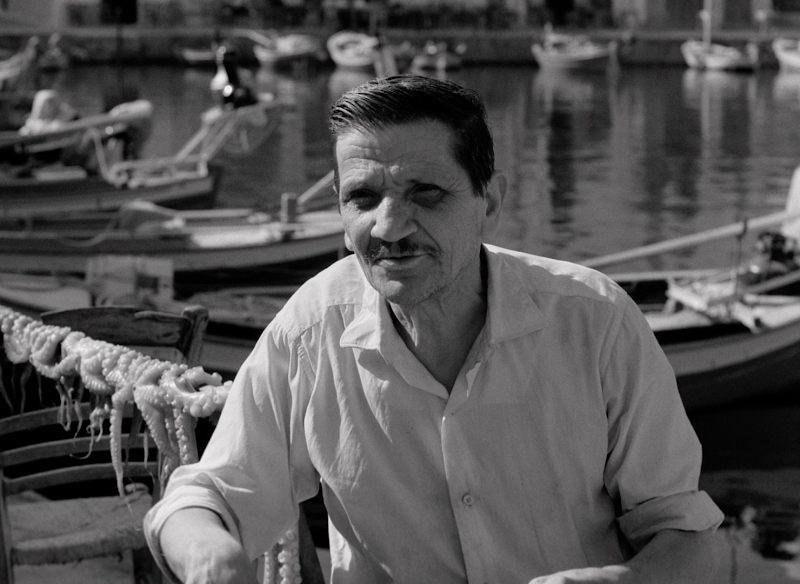 We're back to a real, film-like feel with distinct grain, though it's taken from 16mm rather than 35 elements. You can see the colors have been corrected again, getting rid of that ugly yellow push of the DVD. And of course, it goes without saying at that point, clearing up that horrid interlacing. The 1.33 AR is the same this time, though the framing has been lightly shifted. Once again, we just have the original German audio with optional English subtitles, and additional Italian ones on the old DVD. Yay, for blu-rays! Well, they're nice when you can get them anyway. But this next film, 1976's No One Will Play With Me, is another DVD-only title, I'm afraid. This one's kind of an oddball, not so much on its own terms but within Herzog's body of work. 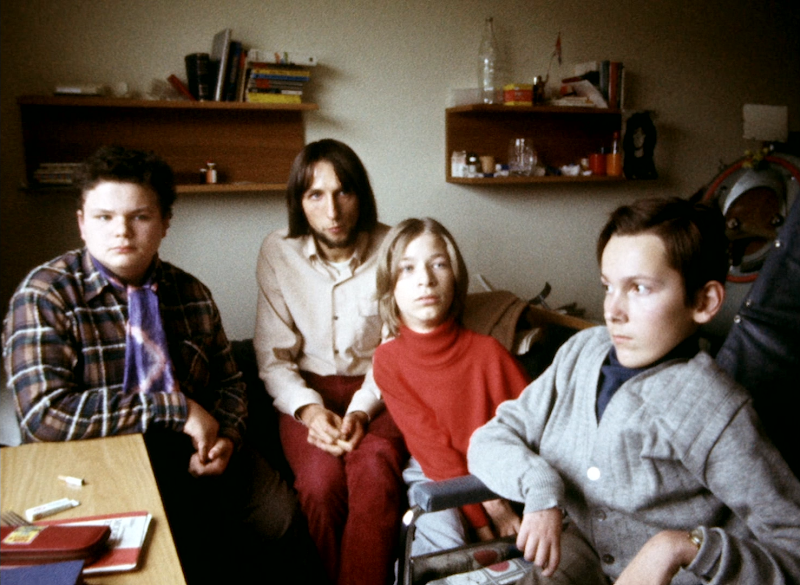 It looks like it might be a documentary at first, along the lines of Handicapped Future, but these kids are acting. Apparently, he talked to school children, listened to their stories, and then made a little drama based on what they told him. It's pretty much all filmed and takes place in a classroom. I'm not sure it's really for children, though, as our star talks about his father beating him and his mother being too sick to feed him properly. It's like the world's cutest film with very dark undertones. And it's just fourteen minutes long. No blu-ray, but at least this one's been released by Raro, so they should have our back with the interlacing, right? Wrong; both DVDs are interlaced. The exact frames afflicted aren't always the same, and the 1.30:1 framing is slightly different. But it's all academic; neither one can really be said to be better than the other, they just have insignificant, arbitrary distinctions and are clearly using the same, root master at their cores. Both have the German audio and optional English subtitles, though only the Raro also has Italian. 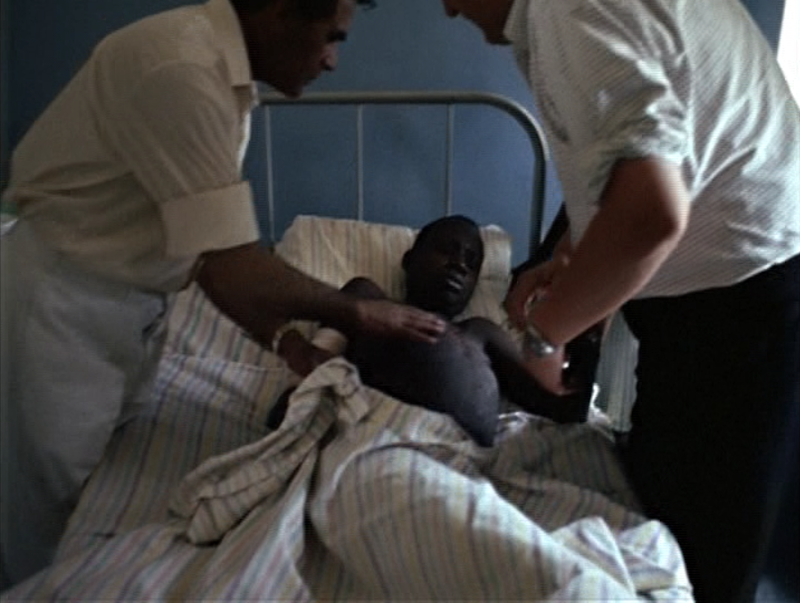 And no blu for 1977's La Soufrière either, except again for that Revolver blu that really just slapped it on as a standard def extra. This is peak Herzog, though: a documentary where he goes to film an erupting volcano on Guadeloupe after the area's been evacuated. He talks to three eccentric locals who've decided to stay, at least one specifically out of a desire to die. If you want to see one of his famous, mad journeys where he puts himself in ridiculous damage in the name of film, and capturing footage no one else would dare, here you go. I've only got it in the .com box, but it was released on one of those rare New Yorker DVDs, too. Yeah, it's interlaced, and yeah, it's kind of green and murky... although some of that may be due to the sulfurous smoke and dust Herzog's carrying his camera through. The 1.29:1 framing is probably a little too slim, but until someone restores it for HD, what are you gonna do? An upside here is that the boxed set includes both the German and English audio, as well as optional English and Italian subs. 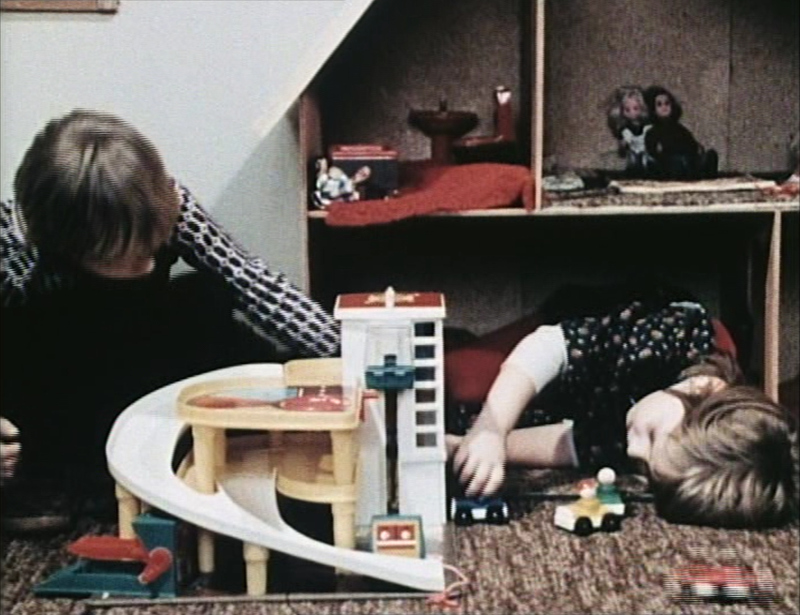 At least we can end (Part 1, The 60s and 70s) with a short that has been restored again. 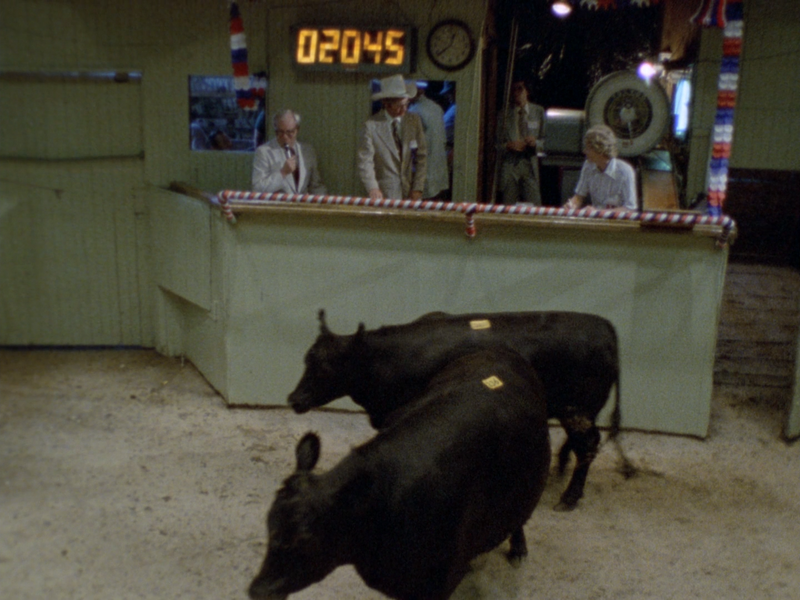 1978's How Much Wood Would a Woodchuck Chuck is a silly but entertaining study of what Herzog calls a new language: cattle auctioneering. 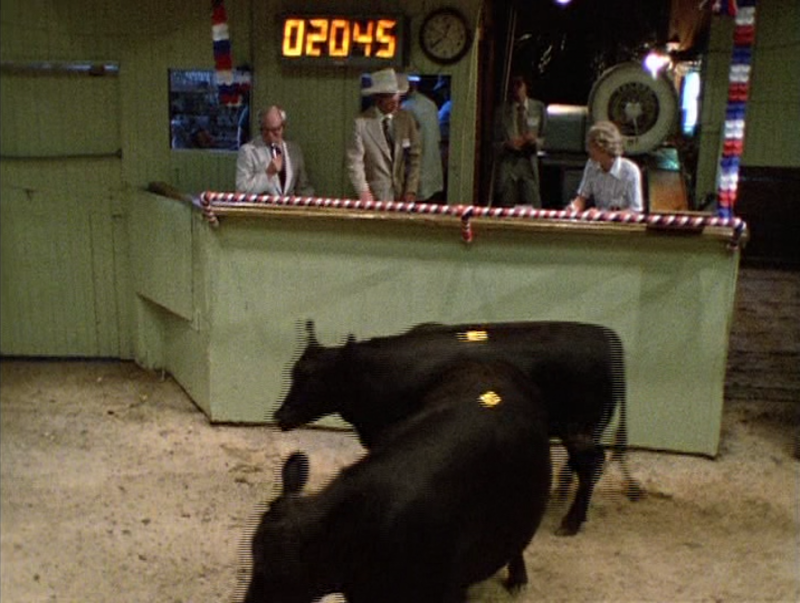 It's filmed at a "world livestock championship" in Pennsylvania. It's full of fun characters from Amish locals who show up and give out free food to the first ever female contestant, the international champion and plenty of bulls. The interviews are all a kick, though the auctioneering itself does start to grow tiresome after a while. We've got just two discs again, the .com box and the BFI blu, though this is another one of those available on a rare New Yorker DVD as well. Honestly, if all BFI did was fix that interlacing, I'd be happy. It's just so gross. But of course, they did plenty more than that, clean up noise, pulling in a little more picture around the 1.33 edges and bringing the slightly over saturated (overly red) colors back down to normal. But I just look at these shots and all I can think is finally, no more of that combing! Now if I can just get the replace the rest of the titles in this box, I'd be all set. 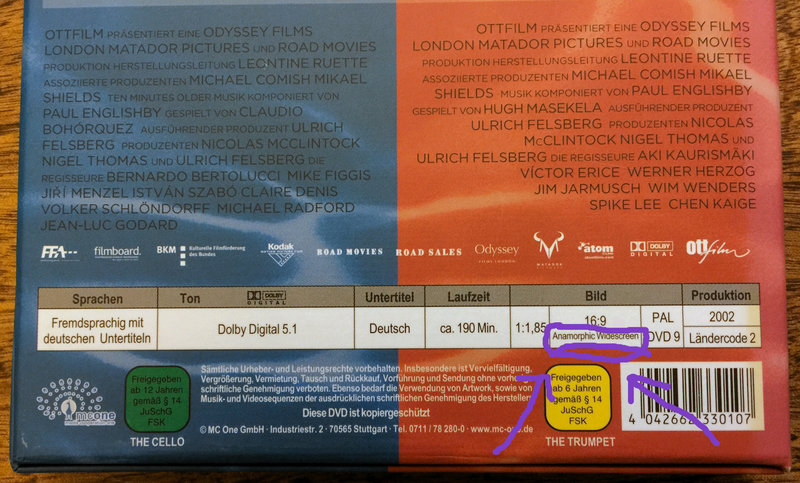 One extra bonus: while both discs give you the choice between the English and German audio tracks, only the BFI disc threw in English subtitles as well (the DVD just has Italian subs). So here feels like a good spot to call it a day: right at the dividing line between decades. We'll pick back up with Part 2 in the 80s, and go straight through to the early 2000s. We've got another ten or so short films still to go, and we'll shake up the monotony a bit more next time with some more discs from some more different labels; it won't all be wernerherzog.com, Raro, BFI. So see ya then!